If like me, you are born and bred in the UK, you may not truly realise how lucky we are. The NHS is an amazing service that we all take for granted at times. I hear of friends or I read news stories of people in the US who have health conditions that need a specific treatment but their insurance won’t pay for it- they simply can’t have it. It’s not always the types of drugs that we may be denied due to the postcode lottery that we see here, but relatively normal drugs that can help with conditions such as Rheumatoid Arthritis. The drugs that I have been prescribed instantly, are won and lost in a corporate battle. Others may find themselves in a situation beyond their control, require medical help and find themselves with a bill into the hundreds of thousands. If the NHS is privatised and we lose what we have now, I fear for our future. Without the NHS, I don’t know where I would be. I am truly thankful for all the amazing nurses, Drs and support staff that spend their lives making others better. None more so than the huge team that helped me. 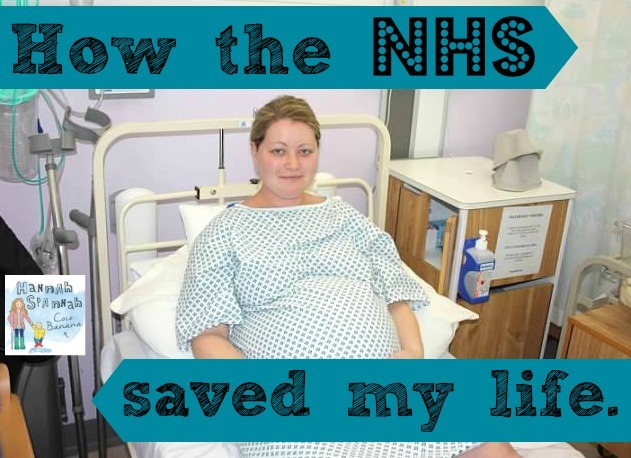 How the NHS saved my life. That’s a strong title. I was unsure as to whether to write this or not. I don’t want to scare anyone, yet this happened. It is rare though and it explains a large chunk of my c section experience that I wrote about here. I had a successful and relatively uneventful C Section (well, if you can call having a baby uneventful!) but what I mean is that nothing terrible had happened. My placenta had been removed ‘peacemeal’ which means that it was removed in pieces. I’m not sure why it was removed like this but I know it’s not out of the ordinary. I had also lost about 500ml or half a pint of blood, but again, not excessive. I was taken back to the ward and we had a wonderful time getting to know our baby. It must have been at least an hour and a half later as my Dad had gone home as he was tired. My Mum and sister were in love and decided to stay as long as possible! I was in a tiny country hospital and had the ward to myself so no one minded. I was holding little man and said to my Mum that I didn’t feel right. I felt light headed and I remember saying that I couldn’t see right and that my eyes were going funny. We just thought that I was tired, the adrenaline had run out and of course, I’d just had major surgery. I was still wearing my hospital gown and hadn’t had a wash since holding my newborn to my chest. Mum went to get some water to wash me and then to help me change. I passed little Bear to his Dad or my sister and mum started to wash my chest. I began to take the gown off my shoulders and we peeled back the sheet. That was the moment that I realised that I was bleeding, Heavily. I had a pool between my legs. I look to the left and it was just about to run onto the floor. I said to Mum ‘I’m bleeding. Mum, that’s a lot of blood’. Mum hit the emergency button and ran off the ward. I woke up some time later. What had happened next was terrifying for my family to see but for me, I was fine! I had no idea what was going on and when I came too, I just lay there and didn’t think much of what was going on. Midwives rushed in, pagers were buzzed, dr’s came along with my surgeon, anaesthetist, and others. All in all, I think about 10 people were crammed into my cubicle. My Mum sister and baby were outside of the curtain but my (now ex) husband had refused to leave when he had been asked and stayed in the corner. I came to, to a dr trying to get a cannula into mr right hand. There was one in my left but they struggled after that. I heard him say that ‘her veins are flat’ and he tried about 4 times in my hand and arm and finally managed in my inside elbow. I didn’t feel a thing. Two midwives stood with bags of fluid and a synthetic hormone to make my uterus contract. One read the numbers off the bags, another wrote it down and then they were administered. At the same time, a dr had her hand- there’s no easy way to say this- inside me, in the same way as you would be examined during labour and was pulling out blood clots. My ex says that one massive one was removed and blood ran out like a river. 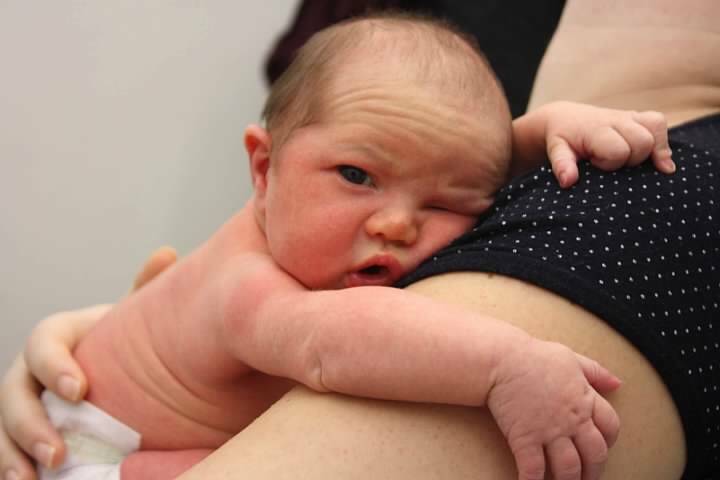 Two other midwives were taking it in turns to compress my stomach like CPR. This was to try to make my Uterus contract. My understanding is that the placenta is like a scab. When it is delivered, you have an area of your uterus that you could compare to a graze. When your uterus contracts, you don’t bleed heavily but if your uterus doesn’t contract, this large raw area bleeds and bleeds. The synthetic hormone I was given and the compressions are the only way to stop the bleeding, other than a hysterectomy. At some point my consultant surgeon came and stood by my right shoulder, the anaesthetist waited outside and the head midwife came to my left. I remember saying to her ‘Hi. I know you don’t I? I recognise you’. She had given me the opportunity to attempt climbing in and out of the birthing pool a few weeks earlier when I was still trying to get approval for a water birth whilst on crutches. I had an oxygen mask on and people kept on asking me if I was ok. I just lay there in my own little world and said ‘yes, I’m fine’. I remember hearing my baby cry and asking how he was and my surgeon saying ‘shall we give her some dignity as I was laying there completely naked and covered my chest with a sheet or my gown that had been taken off. It was touch and go as to whether I was taken back into surgery for a hysterectomy but thankfully they managed to get on top of the bleeding. Slowly but surely, people drifted away except one midwife who sat and watched me all night. It was estimated that I lost 4 pints of blood in total. My husband, mum and sister were traumatised for want of a better word. They had seen so much and were so scared. I am so sorry for what they went through. As much as I know what happened and how scary and serious it was, I was in a soft, hazy world whilst it happened. It hit me a few months later but my poor family got flashbacks and things like watching ‘One born every minute’ was distressing. They changed my sheets but didn’t give me a bed bath for a few hours so as not to send my body into shock. I was pumped full of fluids but unfortunately, I had lost so much fluid that I seemed to lose all my colostrum. My biggest regret is that I hadn’t fed my baby by the time I passed out. I am so ashamed of myself. I had wanted his dad to hold him, my sister, my mum and dad. I wanted them to share the joy of him. I didn’t want to hog him. He also slept and didn’t cry once. I wish I had been prompted to feed him as soon as he was born but I was laying flat and wouldn’t have been able to do it on my own. I’m not blaming the midwives in anyway though, without them, I’d have never been able to feed my son. I fed baby bear some formula out of a tiny feeding cup and my battle to breastfeed began. After my inlaws had visited (I kept myself well covered!) I was given a bed bath and was quite shocked to see how much of my body was covered in blood. I was still attached to drips and after everyone had gone home, my little man and I settled down for the night. My bleeding was monitored during the night and had thankfully slowed. At some point however, the hormone drip ran out. I woke to the beeping of the machine and the midwives came to change the bag. Unbelievably, within 5-10 minutes of the first bag running put, I felt a massive gush and low and behold, I had lost more blood. I had more stomach compressions (ouch as the spinal block had begun to wear off and I’d just had major surgery where they were squashing, very hard!) and with that and a new bag of hormones, everything calmed own again. By morning, everything was normal, my catheter was removed and I was able to stand and make it to the bathroom (with my crutches). My baby boy was born on the Thursday and after the PPH (Post Partum Hemorrhage) my blood iron levels were checked and were ok. But….it seems my levels hadn’t dropped by then. By the Sunday, I was so weak and woozy. In the middle of the night I had a midwife helping me with feeding and I told her how bad I was feeling. She put two and two together and decided to have my iron checked. The results came back at about 5am and my Ferritin was a 4 which is pretty low. The midwife told me they had arranged for me to have a blood transfusion and by 10 am, I had started to receive 2 units of blood. It was a strange feeling. It was weird to think about what I was receiving but it made me want to give blood immediately. I realised just how important it was and is to give and decided that I must sign up. Darn it though, once you receive a transfusion, you can no longer give blood. I was gutted. If you have ever thought about giving blood then please do it. If you’ve not thought about it, think about it. If you already give, thank you. I am sorry that I never did. Look at the state of me. So pumped full of fluid that when I weighed myself the day after giving birth, I weighed the same as I did before birth and I’d had a 8lb2oz baby! That evening was hilarious. I was bouncing off the walls! I had so much energy and couldn’t sleep! I was hobbling through to talk to the midwives in the middle of the night as I was bored! That rush had worn off by morning but I questioned what they had actually given me as it was an amazing feeling! I guess I had been feeling really really bad! I had to stay in for 24hrs after the transfusion in case I suffered a side effect but all was ok. I stabilised, feeding became more established and my milk finally came in on day 6. This usually happens around day 3 but it had been delayed due to my body concentrating on making blood before milk. If you’d like to read more about my breastfeeding journey, I will write that story soon. So after being admitted on the Thursday, I was well enough to come home on the following Wednesday afternoon. I was so happy to go home but I cried as we left as I was so overwhelmed by my feeling of gratitude to all the midwives and Dr’s that had cared for us. I will never forget what happened. Sadly, this wonderful Maternity service has closed. The ward has changed to a Midwife led unit with no Theatre or consultants in house but in the larger hospital, 30 minutes away. 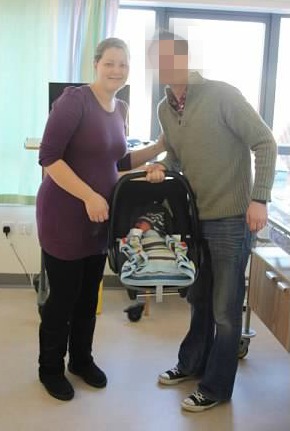 It has become the exact type of place that I wanted to give birth in but due to having the PPH, if I were to ever have another baby, I would be at risk of it happening again and would need to be on a hormone drip from the moment I delivered and so would have to give birth in the larger hospital, further away. It’s sad as it was such a wonderful, small unit that had a special, friendly atmosphere and there was always a recognisable face there. I returned, a month or so later, for a recommended ‘debrief’ with my consultant surgeon. It was suggested as what had happened was pretty scary and I could struggle to deal with the emotions and stress from it. I have to say that it felt like a waste of time as he just said ‘its one of those things, it wasn’t very serious’ and that was about that! It felt very serious to me, I can tell you that! However, the NHS saved my life and I will be forever grateful. We are so lucky in this country, I don’t think we even know it. Saying that, our country has one of the largest rates of still birth in the modern world. This needs to be changed. I am working with MAMA Academy to help raise awareness and support Mum’s to be and Midwives, to help reduce this number. How is the MAMA Academy doing this? Their Made to Measure campaign aims to save 1000 babies’ lives every year by calling on all UK hospital trusts to adopt the Perinatal Institute’s GAP programme. GAP uses customised growth charts alongside a package of training and support to better detect growth restricted babies, a key risk factor for stillbirth. MAMA Academy Wellbeing Wallets are designed to keep antenatal notes safe and are printed with important educational messages for a healthy pregnancy. The advice is regularly read whilst mums wait for appointments in antenatal clinics, making the knowledge second nature. 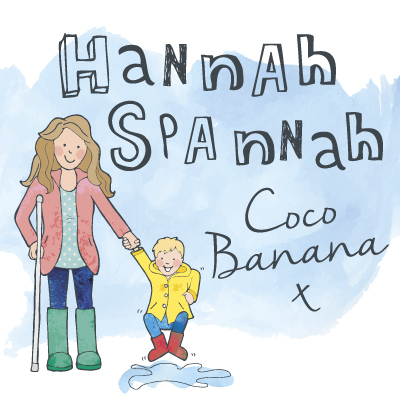 They also help midwives start conversations with mums on vital pregnancy topics such as monitoring babies’ movements.They are working closely with NHS England to provide these wallets to ALL trusts to give to mums at their booking appointment. Their videos support health professionals by encouraging them to work together to save 1000 babies lives by adopting The Perinatal Institute’s GAP programme. One of them is a short educational film for midwives on how to accurately measure symphysis fundal height, a vital skill to correctly plot baby’s growth on the customised chart. MAMA Academy’s hospital presentations empower midwives with the belief they can change practise for the better. We equip them with powerful knowledge on stillbirth prevention and change attitudes to enable trusts to know that stillbirth can sometimes be avoidable and not just “one of those things”. 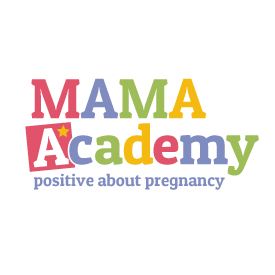 The MAMA Academy website and active social media communities encourage pregnant women to equip themselves with the knowledge they need to give their baby the best possible chance of arriving safely, and enable women to learn from each other’s experiences. 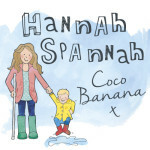 Please take a look at their website here and pass the information on to any pregnant women you know. You could save a life. I hope my story about how the NHS saved my life has not been distressing. This sounds horrific, and I’m pleased you were okay in the end, but man that must have been so scary for those around you! I think it was pretty bad for them. I forgot to add that we were encouraged to have a debrief a few weeks later, with the consultant, die to the way it can affect you. Scary times but worth it! Wow what a scary time for you and your family! We’re so lucky to have the NHS. 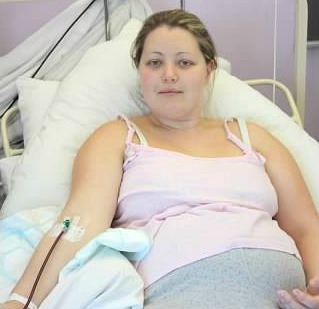 Oh my goodness, that must have been so scary – so glad that the doctors and midwives acted quickly and got on top of the bleeding and managed to avoid you having a hysterectomy too. 4 pints of blood is a lot to lose – so glad you were ok and that the blood transfusion made you feel so much better. The NHS is definitely something to be thankful for! This sounds absolutely terrifying. I have been so lucky to have three straightforward-ish births, but I cannot praise the NHS enough, especially after the care they gave Ben when he was seriously ill.